The Google Code In is now over. I’d like to thank all of the students, and the Haiku mentors, 30 in all, for all their hard work. I’d also like to thank Google, the Melange team and Carol Smith for running GCI. Haiku had over 150 tasks completed by students! Many of the tasks completed for Haiku were for translations. In all, there were about 65 translation tasks completed, nearly completing 12 different languages, and partial coverage on 7 more. One student, when we couldn’t find a mentor to cover the Romanian translations, went out and found a mentor, and then she proceeded to translate all of the apps and preflets that are in HTA, all while she was also doing tasks for several other orgs. In case anyone is interested in working on the translations there is still a lot of work left to do on some of the less common languages. If you are interested in helping out, join the Haiku-i18n mailing list. To work on the localization of the system, go to HTA, register and get started. To start a new translation team for the user guide, read Starting a new translation. 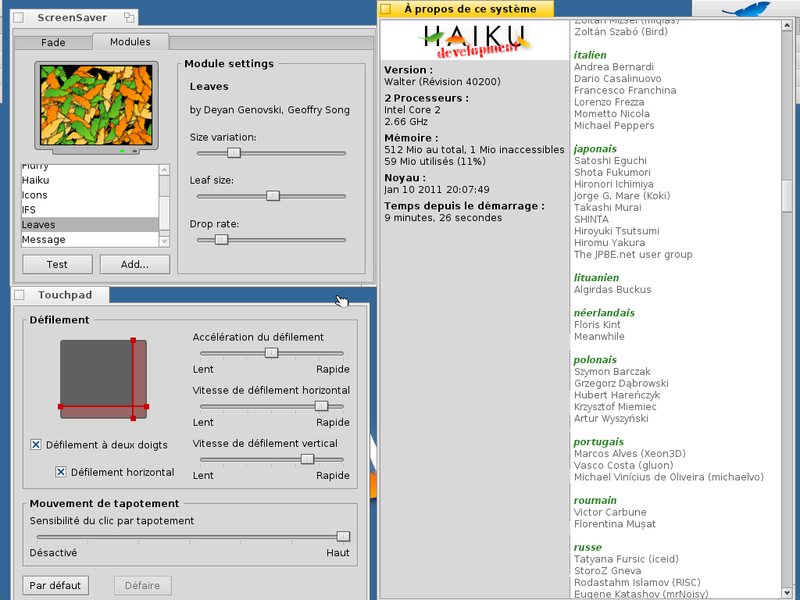 Haiku get's a couple of new screensavers, several new translators for many languages, and some more i18n'd applications and preferences thanks to GCI students. We had 30 coding related tasks completed. There were also tasks for Testing (32), Outreach(10), Documentation (13), Research(25), Training(1) and User Interface(11). Of the coding tasks, many were to fix bugs in Haiku or HaikuPorts. We also had a couple of tasks completed for writing a screensaver for Haiku. You might have noticed these, as they are now included with Haiku, “Butterfly” and “Leaves”. Some of the research, testing and documentation tasks produced some sets of data that we will be able to put together some data packages to allow for users to test Haiku better. Others were for articles that have already been posted to the web site or will be soon. A couple of the user interface / research tasks provided mock ups of how the wireless network preferences and the package manager might look like. All in all the Google Code In was a fun and exciting project for Haiku. We gained a lot of young fresh eyes, some of which were using Haiku for the first time. Hopefully many of them will stick around and perhaps some of them we’ll see again, either in a future GCI or GSoC or as new regular contributors.